I’m one of those people that keeps every text message I send or receive — I never delete them. Meet a girl at a bar, text her the next day and never hear back from her? I keep that. Weird wrong-number texts? I keep those too. Ex-girlfriend texts? Definitely keepers. I had 65,378 messages on my phone at the time of writing this post. I’m not a digital hoarder or anything, but I primarily do this because I like the idea of being able to search through the past. But, digital hoarder or not, collecting anything takes up some sort of space, and when I found that my text messages were taking up 4GBs of space on my phone, I decided it was time to back them up. It was at that point that I realized I could also probably analyze them. As it turns out, you can do this, and I’ll tell you how. For this project, I used Python/Pandas/NLTK for the analysis and an iPython Notebook to render the datasets. I’ve also uploaded the code to GitHub, which you can view here. Sync/back up your iPhone because the messages need to be stored on your computer. You can follow the directions for retrieving the right file here. Analyze those mensajes (I used Pandas)!! Let’s get into some details. You need to sync and back up your phone’s contents to your computer. There’s a great post on how to do this here. In case you want to skip that read, you’re ultimately getting a file with the text messages in it; copying it and moving it into your working directory. From here, the main tables I found useful were “message” and “handle.” The former contains all of your text messages, and the latter contains all of the senders/recipients. I only wrote code around the messages table, primarily because I could never figure out how to make a join between message and handle, but that was probably something trivial that I overlooked. Please tell me how you did it, if you did! Analyzing the content of the “text” field (excluding emojis). Analyzing the messages themselves (for example, total text messages, or, what I sent vs. what I received, for instance). Classifies all words and assigns a part of speech to them, then check the counts of each part of speech. You should get a table looking like this. Excludes boring words, like prepositions, and words that are < 2 characters. 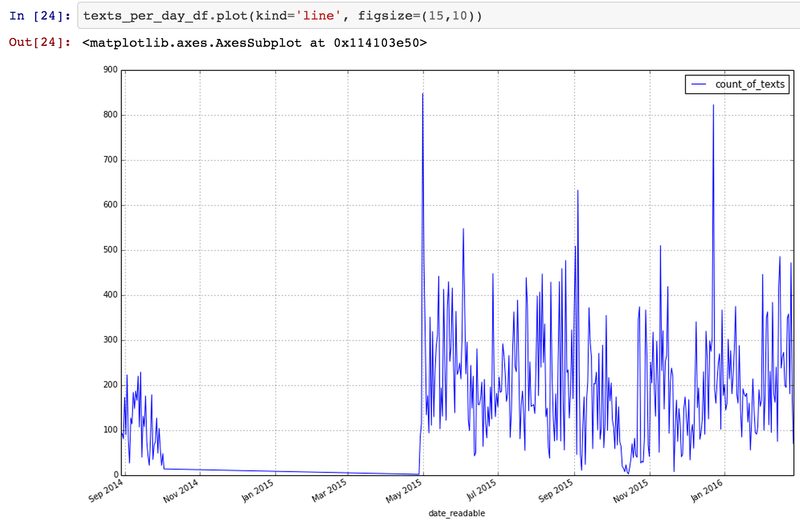 Plot the number of text messages received each day (check out the spike on your birthday or during holidays). You can see my data below has a huge gap (that’s when my phone was replaced and not backed up for many months. My timestamp conversions are also apparently incorrect, but I haven’t looked into it. The timestamp conversion is off, so someone can fix that… we’re not in 2016, yet…Or am I?? Count the number of sent versus received messages. Anyway, I hope you can get some use out of this, and instead of blabbing on about the code here, I’ll just let you read it and use it on your own. Please check out my git repo, and please reach out to me with questions, comments, etc.